Coming soon: the ‘gramophone’ Bluetooth speaker that’s made of vinyl | What Hi-Fi? There's no shortage of vinyl-inspired projects on Kickstarter, but this is one of the most innovative we've seen. It's a wireless speaker to which you stream tunes from your phone over Bluetooth, but it takes its design cues from a classic gramophone. The main selling point? The speaker itself is made out of reclaimed vinyl. You can even choose which musical genre the record is from, to suit your own taste in music. Pick from ’60s or ’70s rock, the ’80s, R&B, diva, show tunes, crooner, disco, jazz, classical, opera, folk or classic country, and the makers will craft the speaker from a vinyl album from that genre. You can also add a personalised label with your own text, a picture of your choice, and even specify which album you'd like to use, as long as you send it in on vinyl. To get your custom-made speaker, you'll have to pledge $195 (about £150). 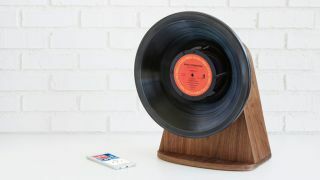 The device - rather unimaginatively called the Vintage Vinyl Bluetooth Speaker - is a joint creation from Uncommon Goods and Vinylux. The two have worked together since 2002, when Vinylux's Jeff Davis made the Record Bowl. This project is obviously a lot more amibitious, but it still sticks to Vinylux's upcycling ethic: no part of the vinyl is wasted. Album covers are turned into sketchbooks and notecards, and paper recyclers collect leftover material. And the vinyl scraps? They're sent to record-pressing plants where they're re-ground and turned into new records. The project is already well on its way to its $10,000 goal, and should ship in September.